Homecoming Hijinxs is the first level of Donkey Kong Island in Donkey Kong Country: Tropical Freeze. 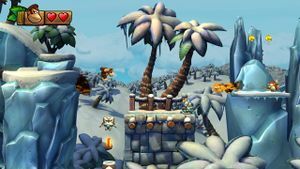 This level is reminiscent of the Jungle levels of Donkey Kong Country Returns, but it is covered in ice due to the invasion and influence of the Snowmads on the island. The level starts near Donkey Kong's house, which can be seen in the background. The terrain here is too icy to maintain traction and is among many other ice-related obstacles. For example, many of the ice platforms in the level crumble if jumped on more than twice, and objects such as Barrel Cannons and climbable, vine-covered walls are often connected to crumbling ice structures. On many occasions, the Kongs must remain in the Barrel Cannons until the ice breaks and aims the barrels in the correct direction, or they must hold onto the crumbling walls until the vines slide toward a platform that the Kongs can reach. The level also features areas where the Kongs must climb the walls quickly, before the vines slide into an abyss. Alongside these obstacles, enemies here include Tucks, Pointy Tucks, Hootzes, Blue Hootzes, and Archies. The music selection for this area is titled "Snowmads Theme." Donkey Kong's house can be found at the beginning of the level in the background. The path ahead contains the first DK Barrel, which can free Diddy Kong, Dixie Kong, or Cranky Kong. Additionally, the Kongs can find a few Tucks, rows of spikes, and several icy platforms that break if jumped on twice. This leads up to a Barrel Cannon; when the Kongs enter the barrel, they break the ice structure holding the barrel, causing it to tilt. The tilting structure allows them to aim to the next Barrel Cannon. This leads to a whole series of Barrel Cannons on crumbling ice structures, one of which that smashes a Chum Chucker Charlie. An icy path lies ahead, and the Kongs must duck under a few spikes as they slide down the slope. The checkpoint follows, and it can be reached through use of a vine wall. This vine wall is attached to an ice structure that flips 180 degrees on its side before falling into the pit. The letter K is located nearby in the air next to a pair of Blue Hootzes. A Hootz and a Painguin can be jumped on to reach it. A Barrel Cannon here also shoots the Kongs to a wide slope, where a spike ceiling slowly lowers. In addition to moving quickly through here to avoid the spikes, the Kongs must also roll-jump at the end of the slope to cross a pit and reach a vine wall, which falls after a few seconds. A Puzzle Piece is located at the bottom of the vines, but the Kongs must ultimately climb upwards, where a pair of Archies, including one that shooting with fire, are found. The latter O is placed ahead of here above a Barrel Cannon in a pit. The path beyond consists of several crumbling ice platforms, as well as a vine ceiling. Donkey Kong must hold onto the vine ceiling until the ice swings closer to the next platform, where the checkpoint is found. The path ahead is blocked by walls of ice. By grabbing onto a nearby vine wall, the ice wall breaks as the vines crumble through it. However, the Kongs must also jump to a neighboring vine wall before the first set of vines falls. They cannot reach the next vine wall until the first vine wall bounces off of the edge of the next platform. This next platform holds a Harey, who can be jumped on to reach some vines. They lead to a treasure chest containing a Puzzle Piece. A Barrel Cannon nearby shoots the Kongs through a massive stone monument and onto a thin ice platform. The platform leads to the letter N, but it also tilts downward and eventually crumbles in a few seconds, so the Kongs must travel to the letter N quickly. The letter N is also placed next to three Banana Coins. Following this section, the Kongs enter a thin, vertical passage that Donkey Kong can climb up using the vine walls. The walls crumble as he climbs. A Puzzle Piece is hidden in an alcove here. The letter G is located at the top of the passage, but it is above a Blue Hootz and under an ice platform. It can be reached with a roll-jump or with help from one of Donkey Kong's partners. To progress through the next area, the Kongs must rely on a series of vine walls, which are all attached to crumbling ice structures. As they fall, Donkey Kong must jump from one vine wall to the next. Eventually, they ride down a falling structure across from a spiked wall. The structure smashes into a Chum Chucker Charlie. At this time, they must jump off to a set of ice platforms. The Slot Machine Barrel is located here. If all the bananas here are collected, a Puzzle Piece also appears. K: The letter K is found immediately after the first checkpoint next to two Blue Hootzes. To reach it, the player must bounce on the nearby Hootz or Painguin. O: The letter O is located above a Barrel Cannon in a pit, which is found shortly after passing the second checkpoint. N: After shooting through an arched structure from a Barrel Cannon, which is placed immediately after a Harey, the player can find the letter N at the end of a crumbling structure. They must move to it quickly, before the platform falls. G: The letter G is located above a Blue Hootz following the vertical section of falling vine walls. A roll-jump is required to collect it safely. After the first Barrel Cannon section, another Barrel Cannon leading to a Bonus Level can be found hidden in the pit just crossed. In the Bonus Level, the Kongs must use two large trampolines to collect many bananas and Banana Bunches. If all the bananas are collected within thirty seconds, a Puzzle Piece appears. The second Puzzle Piece is located at the far bottom of the clingy vine wall after the first checkpoint. Donkey Kong must collect it and advance quickly before the vine wall crumbles. A clingy vine wall is hidden on the ceiling above a Harey. It leads to a treasure chest with the Puzzle Piece in it. In an area of crumbling vine walls, located before the letter G, the Kongs can find the fourth Puzzle Piece in an alcove. The alcove is hidden by a wooden board. Donkey Kong must collect it before the vine walls fall. A Puzzle Piece over a Barrel Cannon appears under the Slot Machine Barrel when the Kongs collect all the Banana Bunches at the end of the level. If Donkey Kong jumps on the platforms here more than once, they will fall. The beginning of the level, where Donkey Kong's house is visible. The Kongs, in the barrel to the left, must wait for the ice to break before the barrel is aimed to the next barrel. The Kongs must escape this passage before the ceiling closes on them. The walls ahead of here crumble as Donkey Kong climbs them. The name of this level is a reference to Jungle Hijinxs, the first level of Donkey Kong Country and Donkey Kong Country Returns. This page was last edited on December 11, 2018, at 18:49.